Simpex Steel offer stainless steel premium doors hinges in various sizes & guages. Our SS 4x14 Premium Door Hinges comes with 4" and 14 Guage. It is best suitable for all types of home doors and office doors, industrial doors, etc. Heavy Stainless Steel Doors Hinges from Simpex Steel, Rajkot, India. 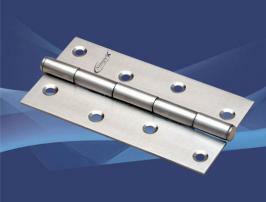 We are one of the leading manufacturer, supplier & exporter of heavy stainless steel doors hinges. 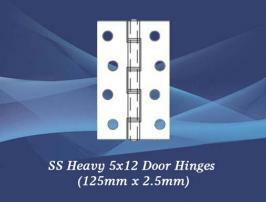 Our heavy ss doors hinges comes in 3", 4", 5" & 6" sizes and in various guages. Our heavy duty door hinges are manufactured keeping in ming easy fittings, zero maintenance and long lasting product life cycle. It is best suitable for all types of raw houses, apartments, residential bunglows, etc. 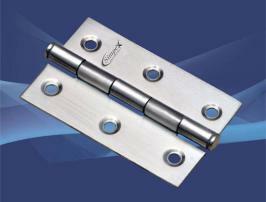 Stainless Steel Furniture Hinges from Simpex Steel, Rajkot, Gujarat, India. 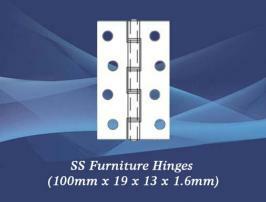 We are manufacturer, supplier & exporter of premium ss furniture hinges in India. 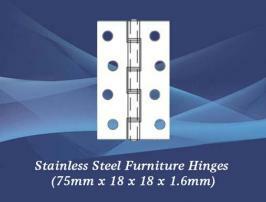 Our stainless steel premium furniture hinges comes in various sizes & guages as per your requirements. All our furniture hinges are manufactured with stringent quality checks so that our customers get best quality ss hinges for their valuable furniture. Stainless Steel Heavy Windows Hinges from Simpex Steel, Rajkot, India. We manufactures, supplies & exports heavy stainless steel windows hinges in varous sizes. Our heavy ss window hinges comes in 3", 4" & 5" sizes and in various guages. Our heavy duty windows hinges are manufactured keeping in ming easy fittings, zero maintenance and long lasting product life cycle. It is best suitable for all types of windows for raw houses, apartments, residential bunglows, etc. Having a sound security system and accident proof house has become indispensable to toady's modern times, especially with an alarming rise in crimes and accidents occurring almost every day. Simpex Steel group of Companies, a renowned ISO 9001: 2008 certified company, is working for several decades with an aim to provide assured solutions for this matter of concern. Since then, we have been addressed as a trademark "Simpex Steel" of various kinds of Stainless Steel Hinges, Door Hinges, Window Hinges, and many other such products. Our products made under the brand name of "Simpex Steel" are designed to provide complete safety and security to our customers by keeping the doors and windows intact. © Simpex Steel All Rights Reserved.